Weeks of speculation have ended with McLaren's announcement that Heikki Kovalainen will be in the second McLaren for the 2008 season. He was always the obvious choice if Alonso went to Renault, although Nico Rosberg seemed a strong possibility until he made it clear that he was staying at Williams. And it was Rosberg that beat Kovalainen to the GP2 championship in 2005, the Finn having led for most of the year. So is this Heikki's revenge, that he has won the race for one of the most coveted seats in F1? Far from being disgruntled at the manner in which he was eased out of Renault, Heikki could have good reason to feel that he is now better off, current form indicating that the McLaren should still be a better car than the Renault next year. Doubts exist over the performance of the MP4/23 next season, however, it being possible that the moratorium on development in certain areas could blunt its edge. And Renault are very upbeat about their new design, with Alonso perhaps bringing the fabled "six tenths of a second" with him. It is ironic that a drop in McLaren performance, coupled with an improvement from Renault, could lead to more Alonso/Hamilton battles, this time in different cars. Shades of Senna and Prost? They too continued their squabble after Prost had left McLaren for Ferrari. But how will Heikki fit into all this? Will he prove an able partner to Hamilton and can the team expect an end of inter-driver rivalries? I think that he will succeed on both points. He has the speed to keep up with Hamilton but does not seem the type to try muscling Hamilton off the road; far more likely is that he will bide his time and take opportunities when they occur. So Heikki may well spend 2008 as a very good choice as the second driver for McLaren. That may seem at odds with his announcement that he preferred not to be regarded as a number two driver (itself probably a warning to Briatore that no way would he play second fiddle to Alonso), but it was also an indication that he understands the equal equipment policy of McLaren in a way that Fernando never did. The team comes first and drivers must be prepared to subjugate their egos when it matters for team results - and I think Heikki is happy with that. If there are team mate problems next year, we all know where they will be: Renault's Alonso/Piquet pairing looks as explosive as they come. It is amusing to think that it was Piquet's father who benefited from Williams' similarly disastrous match of Alan Jones and Carlos Reutemann in 1981. To return to Kovalainen's prospects for the new year, however, it does look as though McLaren have got it right at last. Yes, I supported Gary Paffett's claim as long as there was the faintest hope of his getting the drive (and I still believe he would have done an excellent job) but, now the choice is made, there would be little point in being curmudgeonly about it. And who can begrudge Heikki his good fortune anyway? He had a difficult start to last year but proved himself in the end - good luck to him. 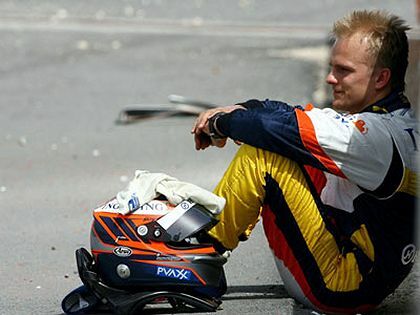 I was impressed by Heikki's performances long before he reached F1 and for a few years he looked like the next big thing before Rosberg took the GP2 title and Lewis became the next big thing. I believe there will be little between the two McLaren drivers and once the season settles down I believe McLaren will have the best driver pairing on the grid. Massa is not in Raikkonen's class. If he couldn't beat him this season when for a long time Kimi was patently uncomfortable with the car/tyres he is not going to match him when Kimi has input into the set up of the car from the floor up and has just become champion. Alonso and Piquet is going to make Mansell and Piquet senior seem tame. Flavio is going to have big problems because on paper Piquet is number two but if he decides not to cede a position to Piquet what can Flavio do since Piquet is the choice of a major sponsor who also happens to be the richest man in the world. Give that Renault's commitment to F1 is always dubious Flavio is not going to want to upset the one person who could buy the team with a few hours interest on his bank balance. I agree with most of what you say but have a slight doubt about Kovalainen, Steven. It took a while but in the end he was beating Fisichella regularly - but I'm not sure that means too much, considering how apparently uninspired Fizzy has looked in the last couple of years. It will be interesting to see how he gets on against Hamilton, however. As for the Piquet/Alonso pairing, yup, that looks like fireworks! I'm glad we're all friends, that way I can disagree with BOTH the above and still come back for the next article. Kovalainen will do VERY well at McLaren as #2 ! Of course the cars have a lot to do with the outcome, McLaren are under some scrutiny and I'm not convinced Ferrari are planning any large changes. BMW are on the rise and can Renault make a comeback? And shouldn't we plan on Red Bull and Williams nibbling away a few points that might otherwise go to the front runners? And then there's Honda ................ there that ought to get the keyboards clicking. It's certainly building up to be a great season, isn't it, Number 38? More teams and drivers with a real chance of winning races, no traction control and an FIA that must surely have had its fill of political shenanigans for the moment - what more could one ask? I am glad for Heikki - this is a good move for him (although, if true to form, 2008 is due to be an 'off' year for McLaren - especially given how they have already been effectively hobbled by FIA-arri). But McLaren will bounce back, they always do. The big Q for 2008 will be have Renault had a return to form? And will the pairing of Alonso & Piquet Jnr work out? And to a lesser extent - will BMW Sauber win a race? Hah! My advice to Ron was to put Gary Paffett in the second car, Peril. But Heikki is a good choice and gives McLaren a well balanced and strong driver pairing. As you say, next season is pretty open and I'm expecting BMW to win more than a race or two. It could be their year if they capitalise on the troubles of other teams. Nick Heidfeld for champion! A pit tour & a hot lap around Albert Park will be thanks enough, OK Heikki? (just in case he is reading). I was actually a bit disappointed that BMW didn't win a race or two this season. As much as I am a McLaren girl, it gets boring seeing the same guys on the podium week in, week out. A few new faces on there would be nice, and hotly anticipated. Oh don't you worry about that Clive, I'll be broadcasting it like there is no tomorrow !